JAGNA – One of the big events the municipality is organizing annually in time for its Foundation Day and Fiesta celebration is the conduct of the “Tabo sa Jagna”. 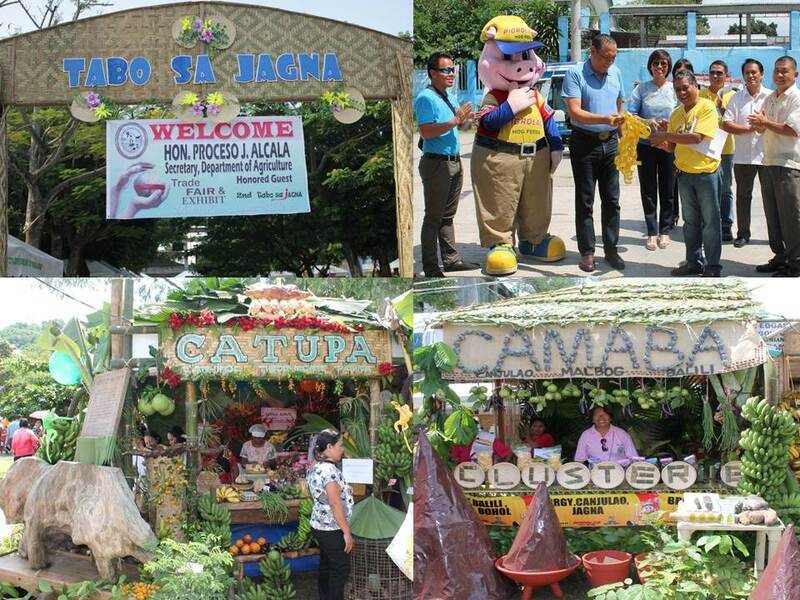 The Tabo sa Jagna is an Agri-Trade Fair and Exhibit which showcases agricultural products from different barangays within the municipality and exhibits from invited merchants and SMEs from the different parts of Bohol as well as outside of the province. This year’s 3rd Tabo sa Jagna is a 5-day affair which will open on September 23 and will end on the 27th. As a kick-off, a motorcade along the coastal barangays of the town will be conducted followed by the ribbon-cutting and opening of exhibits. The invited honored guests are Senator Paolo Benigno “Bam” Aquino and Agriculture Secretary Proceso J. Alcala. The overall Foundation Day theme: JAGNA @ 384: A Milestone Worth Reflecting, Celebrating and Sharing, serves as the guiding principle of this event which includes contests in folk dance, balak and awit nga lunsayng Binisaya all anchored on the rich artistic culture of the town. Booths contain agri-trade products. Produce coming from the barangays will be included in specific contests of PINAKA – Pinakadaghang Buok sa Lubi sa Us aka Bulig, Pinakadaghang Sepe sa Saging sa Usa Ka Bulig, Pinakabug-at nga kalabasa,tambaliyong, ampalaya, buongon, raddish, singkamas, jackfruit, kamatis, watermelon, gabi, ubi, camote, cassava, bellpepper, manga senyorita, bayabas, avocado, mangko, tilapia, bangsi, itlog sa manok bisaya; Pinakataas nga batong, okra, talong, upo, baguio beans. Best Booth and Best Decorated Agri-Float will also form part of the contests to encourage the barangays to be more creative. Learning events include Technical Clinic and Technical Briefing on farming by Municipal Agriculture personnel and Agri-Technology demonstration for crafts and food. A Farmers Funfair (Fiesta Bonanza) and Palarong Pinoy sponsored by BMEG/Pigrolac will take place. The Agri-Trade Fair and Exhibit is spearheaded by the Municipal Agriculture Office, Jagna Sustainable Micro Enterprise Development (JASMED) and Municipal Councilor Maricris V. Jamora.